"Language is a virus from outer space." Reviewing any film or TV adaptation of a work by legendary playwright Harold Pinter is fraught with difficulty and the risk of déjà-vu. Pinter's plays are some of the most analysed and written about in modern theatre, and pretty much anything I say about them is going to have been said many times before, usually in greater depth and by commentators with a more thorough knowledge of the man and his work. My own personal fascination for Pinter's writing lies less in the underlying themes than his way with language, and on that score I can take my place at the rear end of a long queue of people who have been saying the same thing for years. Even Pinter himself, in the extra feature on this very disc, is quick to admit this is a key aspect of his work. So I'm unlikely to say anything new here, just reiterate a commonly admired aspect of the man's writing, but in my own, somewhat scruffier way. "I just saw David out there." "David? What's he doing here?" But break the protocol and see how quickly you confuse or irritate people. Respond to that first "Did you?" with "No" and the cogs start grinding. Sarcasm has no place in the small talk infrastructure. Such conversational exchanges are an aspect of everyday language that rarely finds its way into screenplays or theatrical scipts, where smart dialogue or plot expedience would be hampered by its inclusion. But the top quoted Laurie Anderson built entire pieces of her epic performance work United States around such lingual peculiarities, and the venerable Mr. Pinter has been known to abstract them in a manner that is simultaneously real, unreal and surreal. If that sounds like I'm starting to disappear up my own posterior then I apologise, but I stand by the statement. It's this edgy blend of the familiar and the unexpected, coupled with the author's exploration of the power-play possibilities of language and canny use of pauses, that make his dialogue so arresting. And dialogue like this attracts talented performers who electrify the words further through their delivery. 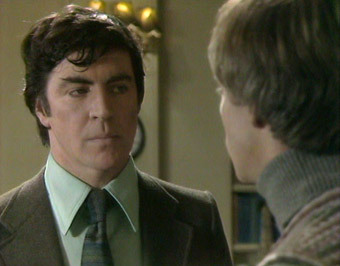 Dialogue and delivery are certainly two of the main attractions of this 1979 Granada Television adaptation of Pinter's 1961 The Collection. The plot itself, although neither complex nor subtextually ground-breaking, unfolds in intriguing and disquieting fashion, while the details of characters and their relationships are revealed over the course of the play rather than being announced up front. It starts when well-to-do, middle-aged Harry arrives at his Belgravia home at 4am just in time to take a phone call from a man who will not give his name and asks to speak to Bill, who we gather also lives in this house. The following morning Harry questions the younger Bill about the call over breakfast – Bill can't imagine who it was and seems unconcerned, but Harry presses him almost to the point of jealousy. Meanwhile over in a Chelsea flat, 30-something Stella exchanges a few words with husband and business partner James – who we soon learn was the mystery caller – before heading off to work. Stella is a dress designer, a field in which Bill has apparently found some fame. 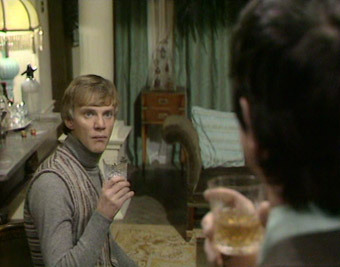 A second phone call that evening catches Bill at home, and without identifying himself, James calmly announces that he's coming straight round. Bill assures him that he's going out and promptly departs. James arrives anyway and is met instead by the bemused but curious Harry, at whom James lobs a few pleasantries before leaving. The following night he catches Bill at home alone, and after a dance of words he reveals the true purpose of his visit, to confront Bill about a one-night stand he apparently had with Stella at a fashion conference in Leeds. The rest of the play consists largely of verbal game-playing by all parties, as James tries to establish just what, if anything, did happen between Bill and Stella that night. Intrigue is established early on and maintained throughout through the exclusion of key details, which leaves us it to surmise, for example, just what was said between Bill and James when we leave their discussion midway, a chat that sees James apparently enriched by the encounter and that prompts him to return for dinner the following evening. But when he explains all this to Stella, is he telling the truth or playing a game with her based on what Bill has told him? And what about her? When Harry drops in to see her in an effort to bring the whole thing to a close, she tells a very different story to the one she has apparently told her husband. 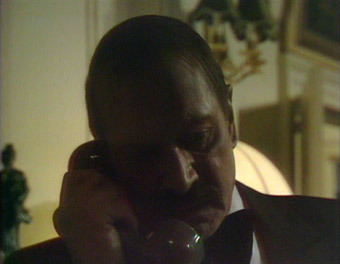 It's an uncertainty echoed in the dual meaning of the final words of the first act, as James continues to prompt Bill for the truth with the words, "Then I phoned. I spoke to her. You were sitting on the bed next to her," to which Bill replies with sudden assurance, "Not sitting. Lying." Tightly but unobtrusively directed by Michael Apted – he of 7-Up and its sequels, many a TV play and a string of solid feature films – the most obvious attraction of this particular production has be its cast. It's an astonishing ensemble for a one-hour TV production, consisting of Laurence Olivier, Alan Bates, Malcolm McDowell and Helen Mirren, with Olivier also acting as co-producer. My earlier point about how great actors enrich fine dialogue is vividly illustrated here, with all four performers on delicious form and relishing Pinter's dialogue, none more so that Olivier himself, who transforms even a simple line like "No potatoes? Extraordinary!" into one that had me giggling with delight. Indeed, I was convinced I'd never seen this piece of television history before until I heard Harry's final speech in pained defence of his young protégé and Olivier's delivery of the term "slum slug," which sparked an instant recall on my part. Whether I saw the whole thing years ago or an extract in a documentary on Oliver or Pinter I can't say for sure, but it's one of those sequences in which performance and dialogue are in such sublime harmony that they park themselves instantly and indelibly into the memory. It's this rare and special meeting of key British acting, writing and filmmaking talents that marks this production as an invaluable piece of television history. 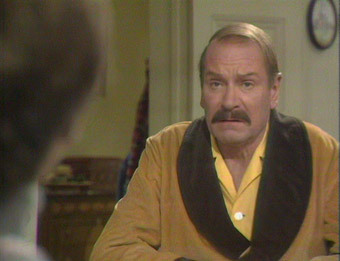 It was one of a series of six plays produced by and starring Olivier for Granada, his aim being to present some of the cream of 20th century theatre for a TV audience who may be new to at least some of it, while for McDowell and Mirren it must have felt almost like a palette cleanser after their adventures on the notorious Caligula. But historical importance aside, the real appeal of The Collection, even forty years after it was first broadcast, is that it's still genuinely riveting television. It may be technically little more than filmed theatre and boast none of the technical polish or pizzazz of the televisual drama of today, but it does serve as a welcome reminder of a time when script and performance alone were enough to hold an audience for sixty minutes, or maybe a time when the TV execs believed in the material and the programme makers enough to let them explore the possibility that this may be so. Made in 1976 for British television and shot on that famed combination of video tape for the studio material and film for the exteriors (which was then transferred to tape so that it could be cut with the video), this was never going to look even close to pristine by today's digital standards. Unsurprisingly, the exterior film work comes off better, with truer colours and better contrast. The studio video varies depending on the light level of the scene in question – the darker scenes come off worse, the narrow contrast range limiting the detail and digital compression artefacts visible in places, but some of the brighter sequences actually look rather good. There are also a couple of picture pings due to minor damage to the original tape. All of which is par for the course for a UK TV work of this period, of course. The soundtrack has similar age and format issues, although the consistently loud background hiss is a bit loud even for taped TV works of the period, making me wonder if this was pulled from a copy rather than the studio original. Just occasionally it's loud enough to give quieter dialogue a run for its money, but for the most part it's just something to be tolerated rather than an enjoyment spoiler. A tantalising extra that kicks off with the following proclamation: "Due to contractual reasons, a number of edits have been made to this programme." Although I saw this on its original broadcast, I can't remember enough to confirm what those missing bits are, but I'm guessing that we're talking about extracts from film and TV adaptations of Pinter's work. A clue is provided by The South Bank Show's opening titles, which have here been reduced to a brief freeze frame, suggesting that even the title music was the victim of copyright issues. This strips the programme down to a conversation between Pinter and presenter Melvyn Bragg, both of them spotlit in a darkened studio in the manner of the old BBC Face to Face series. Fortunately it's still gripping stuff, with Pinter providing open and honest answers to questions about his life, his work and (especially) his politics, which are interspersed with his own readings from his poetry. The picture is letterboxed widescreen and in fine shape, lending further credence to my suspicion that the picture quality on the main feature is down to the condition of the source material. Picture and sound issues aside, this is a valuable revival from TV's vault of past treasures, one whose short running time is given a value boost by the inclusion of the Pinter interview, which is a must for fans of the writer, despite the missing bits. Recommended.